Napavine had yet to be tested prior to this contest. Their margin of victory has been off the charts, and they already placed a 36-6 rout on the visiting Toledo Indians. But that didn’t stop the Indians from fighting until literally the very last play. With just 3 yards (yes 3 yards) of total offense in the first half, the Toledo Indians fought and clawed their way to a 14-7 deficit at half. Their only score, a 76 yard kickoff return for a TD following a Mac Fagerness TD catch brought them even with the high powered Napavine offense. Napavine was able to sneak in another Fagerness catch with just 7 seconds left in the half, taking the 14-7 lead. The stats were unbelievably misbalanced at this time. Total yards were 225-3 in favor of the Tigers. The second half saw constant action throughout. The heavy underdog Indians stormed back midway through the third with an amazing 56 yard pass and catch from Dalton Yoder to Grant McEwen. They added another score early in the fourth, taking the lead in a game they where they were heavily outgained in yards. Unfortunately the PAT for Toledo was blocked, but they still held a 20-14 lead early in the fourth. Napavine answered, as a championship caliber team does, with a march and score. Sam Fagerness this time, Mac’s brother, caught a 29 yard pass from Wyatt Stanley, his third on the day. The PAT was up and good, and the Tigers took a 21-20 lead. After a punt, the Tigers got the ball back, marched again, and scored again on another Stanley pass, his fourth of the day! This final score put the game out of reach for the Indians, who added a safety on the final play to end the contest 28-22. What a game! 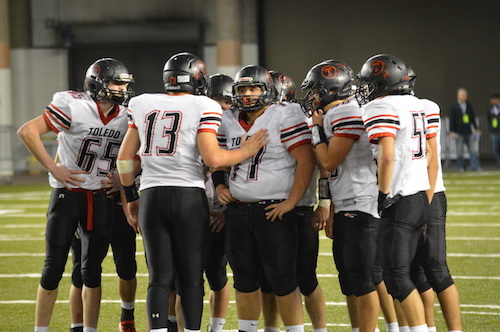 The FinalScore – Napavine 28, Toledo 22.